In addition to Pennsylvania Garden (PG) we have three other projects in the area. Mariposa Center Garden is a narrow sidewalk strip garden at Mariposa and Pennsylvania. Pennsylvania Railroad Garden is the renovation of the entire 100 block of Pennsylvania between 17th Street and Mariposa. The Triangle Garden is the strip parallel to PG, along 18th Street. These three additional projects, abbreviated to MCG, PRG, and TG, bring a huge amount of green space to the two block area, and we are actively seeking volunteer and donor help, as well as grants, to complete them. In 2009 Annie planted sunflowers there. They did OK, considering! In 2010 we were granted funding from the The Godmothers to plant some really tough perennials and make it look amazing. Center Hardware helped too, giving us store credit for needed supplies! You will see all the posts related to this project by clicking "Mariposa Center Garden" in the right column's labels field. Or just click here! UPDATE: Sadly MCP was bulldozed by the city with no warning in 2016 to make way for a wide sidewalk. Very sad about this. 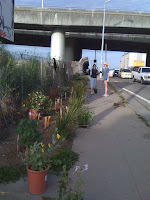 The 100 block of Pennsylvania Garden was just as ugly and trash-strewn as Pennsylvania Garden was in 2008! 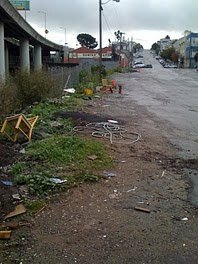 We've worked with DPW, CCG, PUC and SFPA to renovate the area. This is a huge project and it has utterly changed the area. With two large residential buildings with well over 60 units planned for that block or nearby, the influx of residents to the spot in the coming years will no doubt appreciate the work we're doing. Current homeowners can also expect their property values to rise as a result of this work: we encourage you to join in with this project! 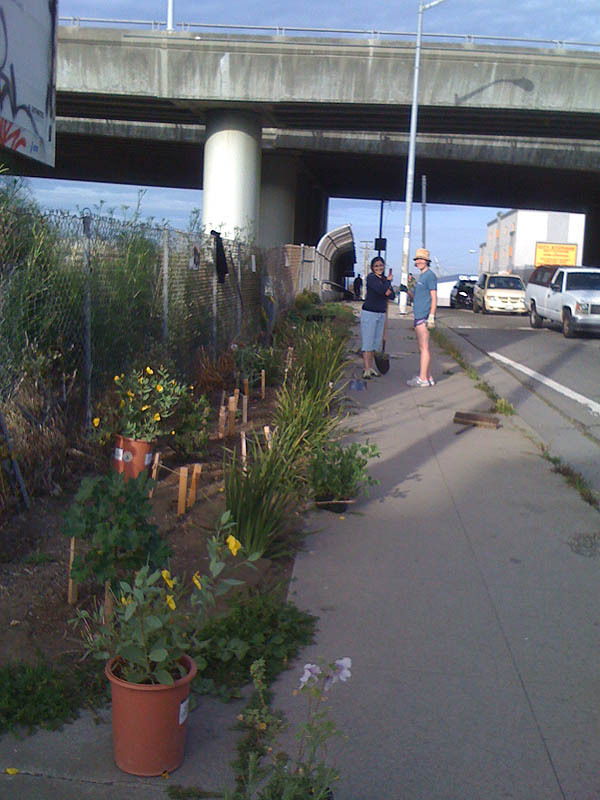 UPDATE: between November 2012 and February 2013 we broke ground, installed the sidewalk, boulders, 23 trees and 800 plants. Left to do are the seating area and signage. Wow! You can read posts on this blog related to that project by clicking "PRG" in the list of labels to the right. Or just click here! The Potrero Hill Garden Club renovated this strip of greenery and Bronze Loquat trees along 18th Street, and maintained it for several years, until March 2013 when they asked PSG to help with upkeep. We're happy to oblige! More news on that soon. You will see all the posts related to this project by clicking "Triangle Garden" in the right column's labels field.